We have featured the wonderful metalwork of Canadian artist Elizabeth Goluch before, in this awesome interview by Crystal Ernst. Now Ben Proudfoot of Breakwater Studios has produced this wonderful video featuring Elizabeth, her inspiration and work. 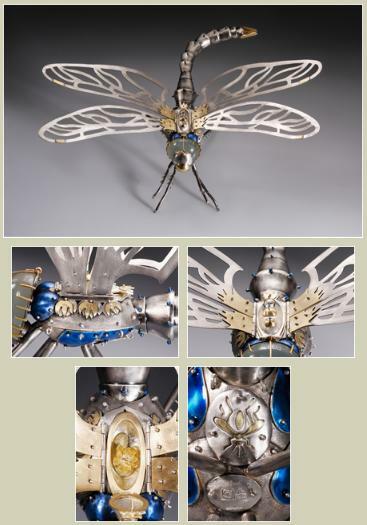 If you are fascinated by insects aesthetically, or have a love for metalwork and sculpture, this is a great introduction to the artistic process! http://esc-sec.ca/wp-content/uploads/2012/09/bumblebee_main.jpg 294 450 Sean McCann http://esc-sec.ca/wp/wp-content/uploads/2017/01/ESC_logo-300x352.png Sean McCann2015-05-29 05:45:272017-10-19 20:30:21Heavy metal insects! Chaque année, la Société d’Entomologie du Québec organise un concours photos, afin de trouver les couvertures du bulletin de la société, intitulé Antennae. Pour aller avec le thème de la conférence de cette année “Entomologie et agriculture biologique; de l’écologie à la pratique”, j’ai choisi le thème “formidable prédateurs à l’action”. 17 photos ont été soumises au total, et les trois gagnantes ont été choisies par vote populaire des conférenciers. Puisque j’était en charge du concours, j’ai décidé du système de vote. Chaque conférencier devait donner son choix de trois photos préférées. 3 points ont ensuite été attribués pour un premier choix, 2 pour le deuxième et 1 pour le troisième. Chaque photographe ne pouvait gagner qu’un des trois prix. Je suis heureux de présenter les photos gagnantes. 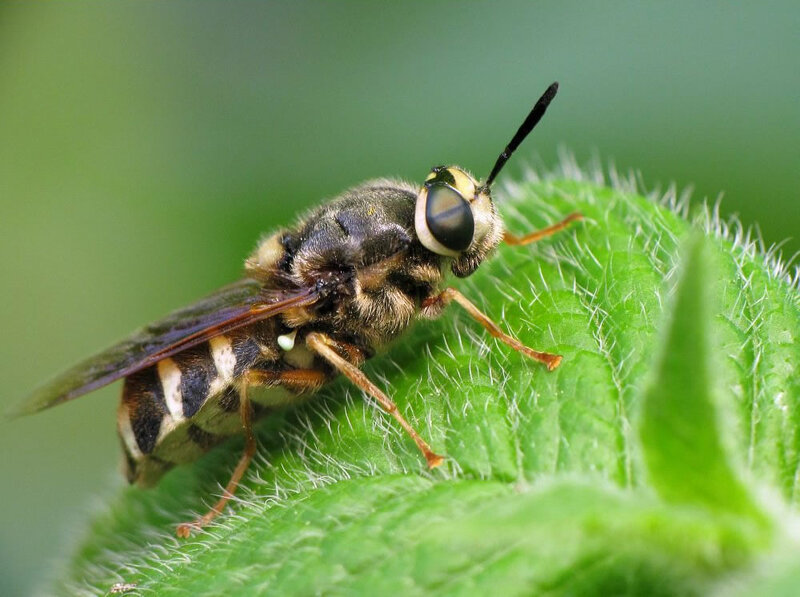 Every year, the Entomological Society of Quebec organizes a photo contest to find cover photos for its bulletin, called Antennae. 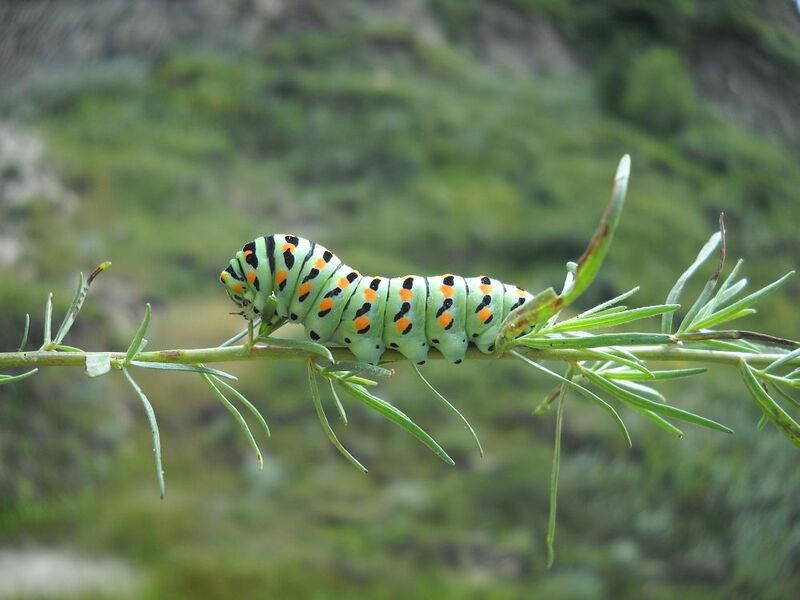 To go along this year’s conference theme “Entomology and organic agriculture; from ecology to application” (my translation), the photo contest theme was “formidable predators in action”. 17 photos were submitted in total, and the three winners were chosen by popular vote of conference attendees. Since I was in charge of the contest, I got to decide the voting scheme. Each attendee was asked to give his first, second and third favourite photos. I then counted 3 points for each first choice, 2 points for second and 1 point for third. Each photographer was only allowed to win one prize. I’m happy to present the winning photos. Congratulation again to the winners! 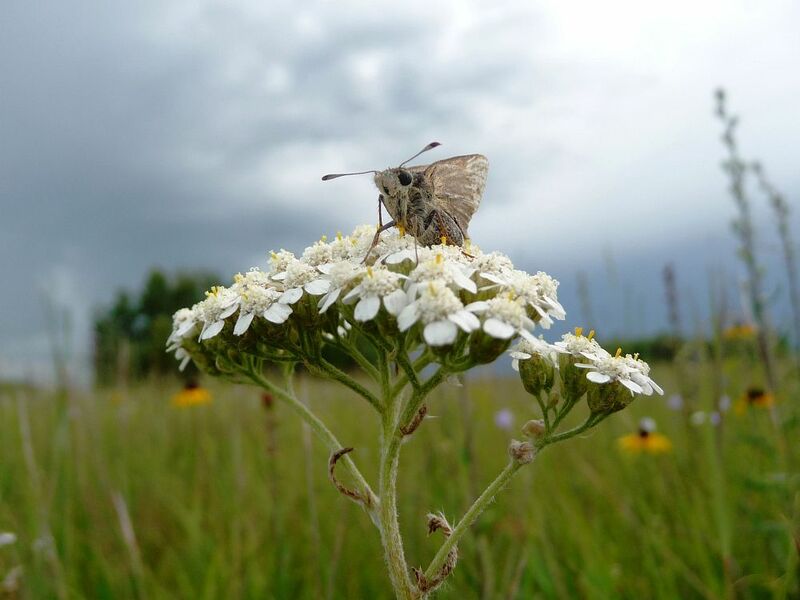 ESC Photo Contest results are in! The results of the Eighth Annual ESC Photo Contest have been announced! Judges Kirk Hillier, Kenna MacKenzie, and Rick West faced a difficult task, selecting the winners from among 67 high-quality entries. 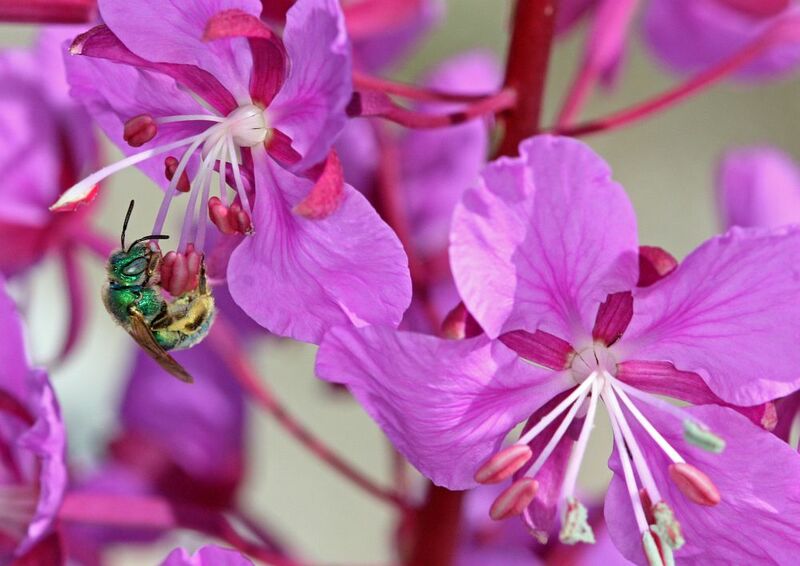 First Place: Bob Lalonde, “Halictid on fireweed”. A female Agapostemon sp. (Halictidae), foraging on fireweed in June on the UBC Okanagan (Kelowna) campus. 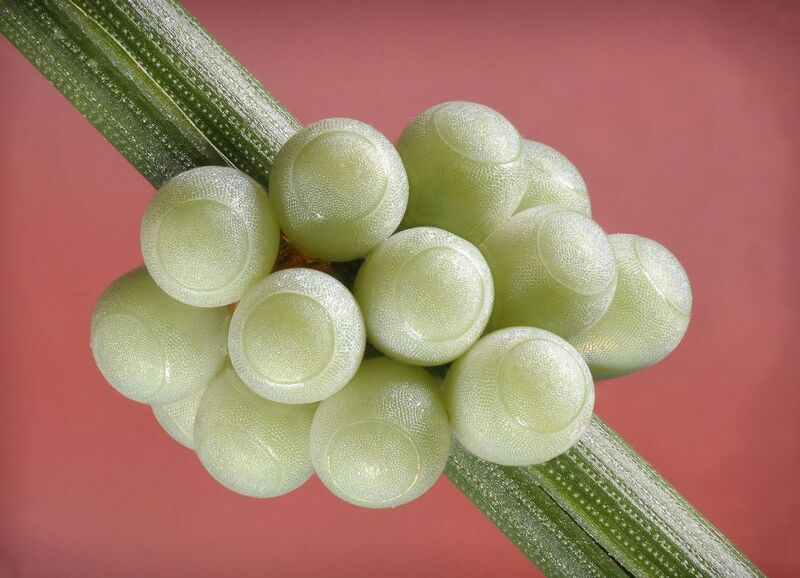 Second Place: Ward Strong, “Stinkbug eggs”. Stinkbug eggs found on the foliage of lodgepole pine, Tappen BC. Fourth Place: Crystal Ernst, “Stratiomys badia”. An impressive bee mimic, Stratiomys badia (Stratiomyidae) rests in a garden at dusk, in Chesterville, Ontario. 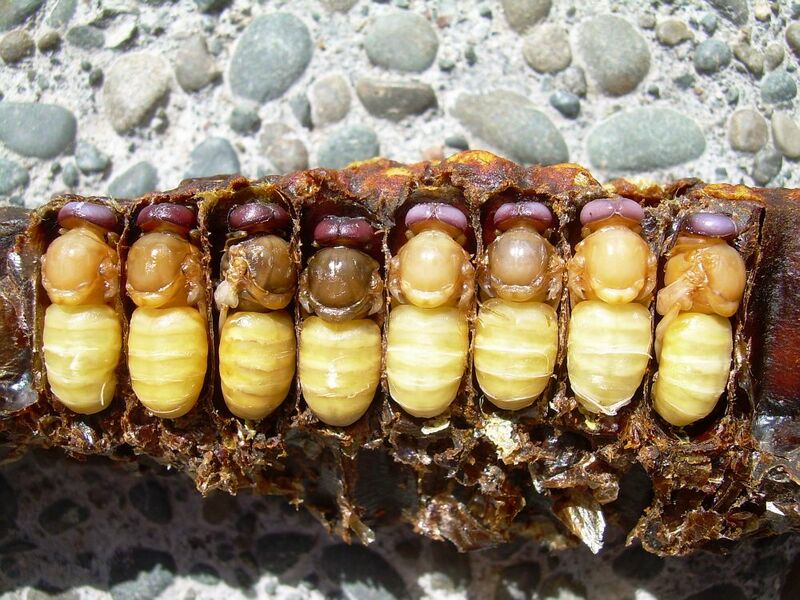 Fifth Place: John McLean, “Honeybee Drone pupae”. Late stage pupae of the honey bee Apis mellifera L. dissected as part of a search for breeding varroa mite (none found). Taken from a hive in the Gisborne area on the East Coast of the North Island of New Zealand, March 2012. 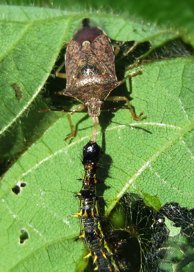 Sixth Place: Tim Haye, “Pachycoris klugii nymphs”. 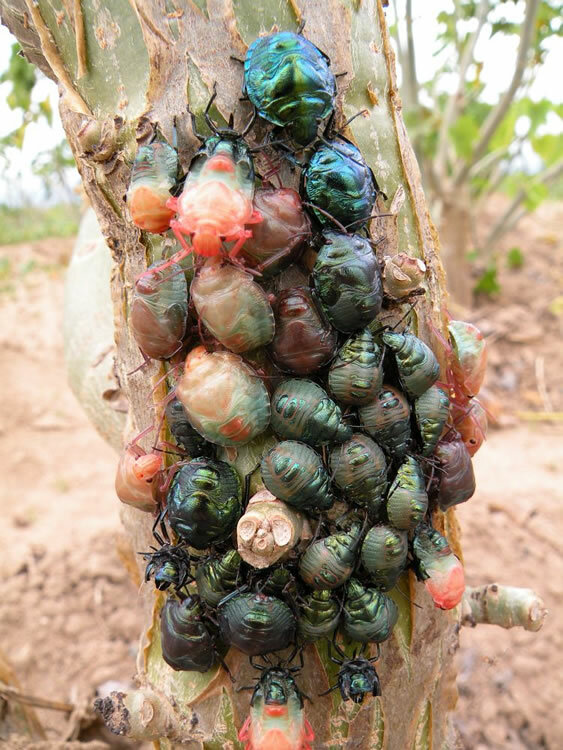 Nymphs of Pachycoris klugii on Jatropha cucras tree (Tehuacan, Chiapas, Mexico). A slideshow of all of the beautiful photographs entered in this year’s Competition is now displayed on the ESC Website, here. Congratulations to the winners!!! If you missed this year’s competition, don’t fret! There is still time to submit your own images to another ESC-sponsored photo contest! ESC (or other regional society) members attending this year’s Joint Annual Meeting in Alberta have until October 30th to get their best shots of the year in to the judges of the 2012 JAM Photo Contest. Thank you one and all for your participation, and keep those shutters clicking! http://esc-sec.ca/wp-content/uploads/2012/10/first1.jpg 707 1000 Crystal Ernst http://esc-sec.ca/wp/wp-content/uploads/2017/01/ESC_logo-300x352.png Crystal Ernst2012-10-17 08:08:132017-10-19 21:06:55ESC Photo Contest results are in! Many of us appreciate insects, spiders and other arthropods for more than just their scientific, biological or ecological value: they also have an aesthetic that some of us find irresistible, inspiring us to capture them in photographs or in paintings rather than sweep nets or aspirators. For this special feature, we interviewed Elizabeth Goluch, a Halifax artist, and asked her about her breathtaking insect sculptures. ESCBlog: Please tell us a little bit about your background – where you grew up, when you started doing art, where you did your formal training. EG: I grew up on a farm in southwestern Ontario. I have been making drawings and objects for as long as I can remember. I took summer drawing classes at the University of Western Ontario, after which I acquired my BFA in 1976 at the Nova Scotia College of Art & Design. However, my major was in Painting. Much later, around 1997, I learned to solder by taking continuing education classes at NSCAD. I also became a member of the Metal Arts Guild of Nova Scotia which is a Guild in the traditional sense. If you wish to learn a certain skill, you have only to ask and another member will provide the help that you need. Over time, I enrolled in several summer sessions at Haystack Mountain School of Craft thereby acquiring additional metalsmithing skills. So I would have to say that I have had little formal training in working with metal and am, for the most part, self-taught. 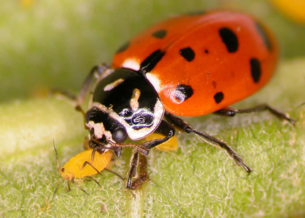 ESCBlog: Why insects? Have you always been interested in insects as subjects for your art? EG: Insects have always attracted me. As a child I collected and examined dead insects, seeing them as objects of beauty. An early memory is one of drawing page after page of spiders which gave me a great sense of satisfaction. ESCBlog: Most of your sculptures have movable parts; many contain hidden trinkets that can be removed and even worn as jewellery. Tell us about this choice to include interactive components. 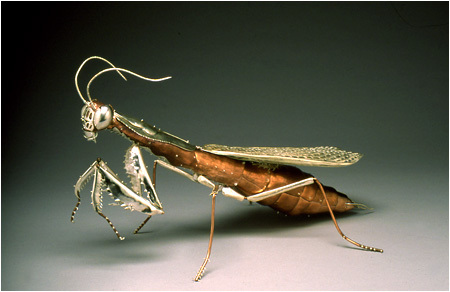 EG: When I first began to make metal insect sculptures, I concentrated on the insect form. Over time, I realized that I wanted to add another dimension to each sculpture which resulted in the secret compartments containing hidden treasure. ESCBlog: Although your pieces are incredibly lifelike, they also include many whimsical elements (a children’s poem enacted in a lady beetle) and often embrace word-play (e.g., the violin beetle). Tell us about your choice to blend the realistic with the fantastical. EG: As my work has grown I have come to realize that, as much as I enjoy accuracy in building the body parts of each insect, I am also interested in telling the story of the insect. This is accomplished by including information about the insect’s life, lore and environment in the decorative details and secret spaces, increasingly important elements of each work. 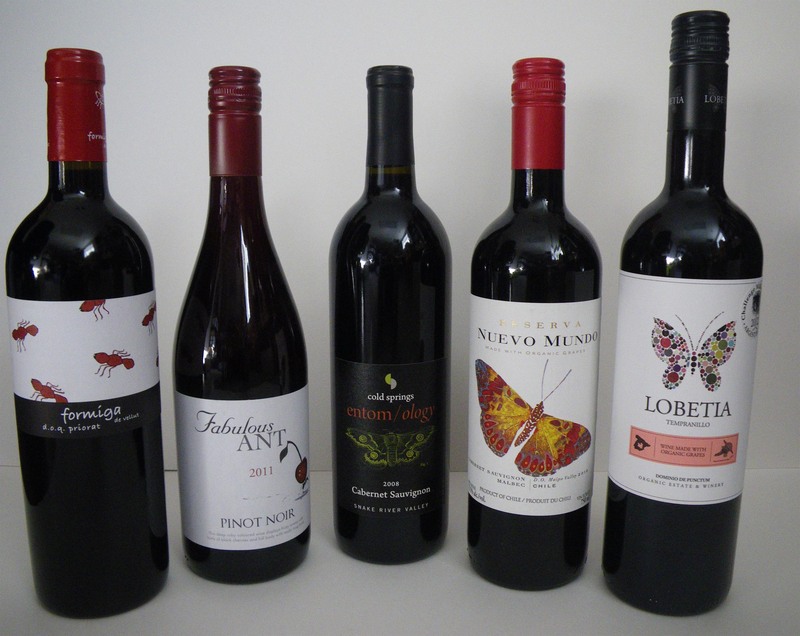 ESCBlog: Insects are so often portrayed as something dark and sinister – something to fear. Your work, however turns insects and spiders into precious things made of gold, silver, pearls and gemstones. Can you talk a bit about your choice of materials in your pieces? EG: Conversely, I have always seen insects as living jewels. 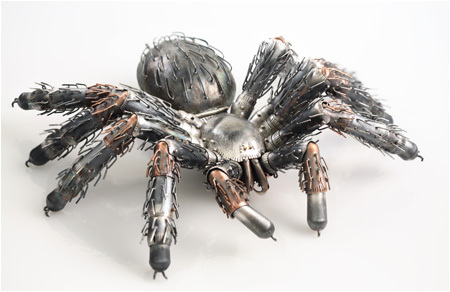 However, I enjoy the combination of fear and attraction engendered in the viewer by the juxtaposition of the subject matter (insects) and the richness of the materials used (gold, silver, gemstones) in the making of the object. 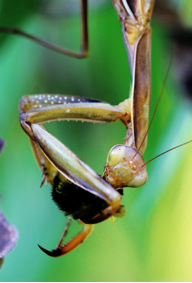 ESCBlog: You’ve tackled many different types of insects, and even arachnids, in your work. Is there anything you haven’t attempted to sculpt yet that you’d like to? EG: There are so many insects in the world that I can’t imagine ever running out of options for the next piece. ESCBlog: Do you have a favorite piece? If so, why is it your favorite? EG: I can’t say that I have one favourite piece. What I will say is that I enjoy the increasing complexity of story and detail incorporated in each new piece. ESCBlog: Can people purchase the work your have shown on your website? Do you ever do commissioned pieces? EG: Much of the work on my website has been sold or was a commissioned piece. I have, on occasion, made a second or third version of one insect (Dragonfly, LadyBug). However, no two pieces are ever the same, each differing in size, details and story. ESCBlog: Is there anything else we should know about you or your work? EG: I have won numerous awards including Finalist for the Lieutenant Governor of Nova Scotia Masterworks Arts Award, the Frank Phillips Award for Excellence in Craftsmanship, Best in Show in many Metal Arts Guild of Nova Scotia Competitions/Exhibitions, grants from the Nova Scotia Department of Tourism, Culture and Heritage, and from the Canada Council for the Arts. My work has been exhibited internationally, including the 2009 Cheongju International Craft Biennale in South Korea where Canada was invited as the guest country, the Cultural Olympiad in the Museum of Vancouver BC to coincide with the 2010 Olympics, Cesky Krumlov in the Wenceslas Cellars of the State Castle of the Czech Republic, SOFA New York and the Mary E. Black Gallery in Halifax NS. One of my works was included in the Metal Arts Guild of Canada Exhibition in Print 2011 curated by Gloria Hickey. My sculptures can be found in public and private collections in Canada, the USA, Denmark, Australia, Turkey and Hong Kong. I have given lectures in Halifax at the Joint Annual General Meeting of the Canadian Entomological Society & the Acadian Entomological Society and at NSCAD, in South Korea at the 2009 Cheongju International Biennale, in New York at SOFA, and in Cornwall ON as the keynote speaker at the Artpreneur Conference. I sit on the Exhibition Review Committee of the Mary E. Black Gallery Halifax NS and on the Standards Committee of the Nova Scotia Designer Crafts Council. ESCBlog: Where can we go to see some of your work? EG: My work will be included in upcoming exhibitions at the Mary E. Black Gallery Halifax NS and at The Rooms Provincial Gallery in St. John’s NL, both of which will subsequently travel across Canada. I am in the Studio Rally Map and will participate in the upcoming Studio Rally Weekend. Availability in Halifax: my Studio – 6913 Tupper Grove, Halifax, NS. 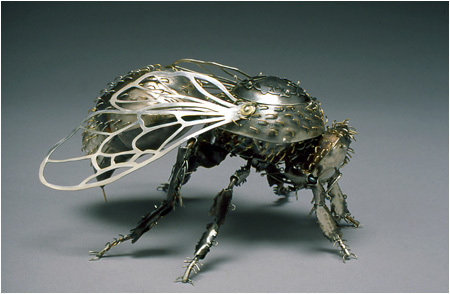 Do you know any other incredible Canadian artists who feature insects in their work? We’d love to hear about it?